Dominique Venner, born in 1935, was a conservative French historian, best known for such works as Le Siècle de 1914 (The Century of 1914) and Histoire et Tradition des Européens (History and Tradition of the Europeans). 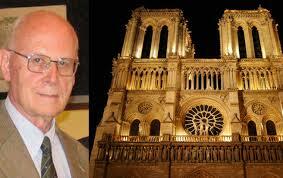 On May 21, he shot himself on the altar of Notre Dame Cathedral in Paris, an act of protest to wake a dying people. Venner’s death shocked France, and the conventional media are already trying to tarnish his reputation (see the miserable hash the New Yorker made of his suicide). It is only from himself and from his friends that we can know the truth. The following two essays, translated by AR staff, are from a remarkable French site, Polemia.com. “History is the realm of the unexpected,” Dominique Venner liked to say, and he has proven this with his suicide. It was a remarkable and violent act in a cathedral—and not just any cathedral. It was an act that demands privacy and respect for him and his family. But also reflection. There are suicides every day for all sorts of reasons, many of them sordid. Studies show that suicide is increasing, especially among young Occidentals, which might lead us to wonder about the excellence of our State. The media loves spectacular suicides, so long as they are in the name of a “good cause:” peace in Viet Nam, the independence of Tibet, or human rights in Syria. The media also praise the “end of life” for old Europeans to ease the burden on Social Security. However, we know that Dominique Venner’s suicide had a completely different meaning. First, it was an aristocratic suicide in protest against a decadent world, against a civilization that has abandoned itself, against the destruction of an identity. Dominique Venner has tragically reintroduced suicide into politics. It is a death that the System uses every means to cover up because it leaves a blot on the artificial paradise the System is building for us. But above all, this death forces us all to reflect on our own lives, and that is what the System hates the most. It would have us believe that nothing is worth one’s life. It teaches this slave morality every day to our children, its future supply of docile humanity. It’s better to be consumers than to be dead! The System also hides from us that it is only we domesticated Occidentals—not the rest of humanity—that believe this cynical ideology. Dominique Venner’s suicide shows us that some things are more important than our individual lives, no matter how brilliant and well lived. This is a lesson the French had forgotten. We learn from the message Dominique Venner left behind that he wanted his death to be a beginning and not just a sad ending. He did not die like a spoiled, frustrated child. His act did not reveal a joyless, decrepit life. It was not an act of hopelessness but of revolt. Revolt against what we see at every turn: a growing chasm between the real France and French laws; oligarchies of wealth, media, and politics that have reached a level unequaled in modern times; the collapse of political parties; the popular reaction against homosexual marriage; the revolt of intellectuals against the politically correct; spontaneous reactions among some of our citizens against crime. The System, despite its media and its riot police, is crumbling. Dominique Venner’s act shows to any who may not yet realize it that the struggle against the System—its acts and its presences—is a struggle unto death. Because the System wants our death. Because it sees people not as ends but as obstacles. It seeks to destroy every identity, every culture in order to reduce humanity to its least common denominator. It despises “the French exception,” which it may some day eradicate completely. As the law on homosexual marriage tells us, nothing is sacred in its eyes. Everything must disappear into that great void of the world market. Dominique Venner showed by his death that neutrality is no longer possible in this struggle to the death. On May 21, a page of our history was turned. The oligarchy is right: It must try to smear the act and the man because it can feel the foundations trembling beneath its feet. In an act of courage, reflection, and conviction, Dominique Venner has chosen to die so that our people may awake and retake their destiny into their own hands. Honor a hero! Honor a martyr! May we be worthy of his sacrifice. Dominique Venner: Why Did he Choose Notre Dame? Dominique Venner’s choice of Notre Dame was a surprise. It surprised his Catholic friends that he should seek voluntary death in a consecrated place. And it surprised those friends who knew, and sometimes shared, his pagan leanings. Let us try to understand this choice in light of his own words. Dominique Venner’s act has an obvious political meaning: It rejects “the great replacement of peoples,” which is even more serious than “the execrable Taubira law [allowing homosexual marriage].” But French sovereignty has abandoned its seats of sovereignty. The Louvre, once a palace, is now a museum. The Elysee Palace of the French President is only a place where decisions made elsewhere are carried out. The National Assembly is a shadow theater in the hands of pressure groups. It would have been ridiculous to die there. Nor does one die in front of an embassy, or the headquarters of a minority pressure group. This is no doubt why Dominique Venner chose “a highly symbolic place, the Cathedral of Notre Dame de Paris, which I respect and admire, erected by the genius of my ancestors on land of cults older still, that speaks of our immemorial origins.” From the first century the Romans honored Jupiter, Mars, Venus and the horned Celtic god Cernunnos. For 850 years, Notre Dame has been the vessel of our national story. It is a historic place, even in the long history of France and Europe. Abbot Guillaume de Tanoüarn [a traditional Catholic and professor of theology at the seminary of Saint-Vincent-de-Paul in Courtalain, France] has called attention to the symbolism of choosing self sacrifice on an altar dedicated to the Virgin Mary: It is the natural choice of a man who emphasized the opposition between the European tradition, which respects women, and that of Islam, which does not. This was a central question for Dominique Venner: For him, the Indians, the Arabs, the Chinese, and the Japanese all have religions based on identity, whereas the Europeans have a universal religion. This was an advantage when Europe was mistress of the world, but this advantage becomes a handicap when Europe is in retreat, suffering from plagues of repentance and guilt: “Other religions, even Islam . . . and Judaism, but also Hinduism, Shinto, and Confucianism are not merely religions in the Christian or lay sense of the world, that is to say a personal relationship with God; they are identities, laws, and communities.” In Dominique Venner’s view, that was what Christianity could not entirely provide because it has a universal vocation. Whence the necessity for Europeans to rediscover their rich identitarian memory: “Because we do not have a religion of identity on which to anchor ourselves, we have a shared memory of our own since the time of Homer, the font of all the values upon which to reestablish our future renaissance.” Dominique Venner’s death was an act of faithfulness to the De Viris Illustribus [On Illustrious Men, a collection of short biographies by Jerome, the 4th century church father] of his youth, but it was also an appeal to return to the classics—to the word, the arts, the comportment. It was a call to waken a people, by a man who gave his life for his convictions. The death of Domnique Venner is not an end but a beginning. Jean-Yves Le Gallou is one of the founders of Le Club de l’Horloge and is a former Front National deputy to the European Parliament. He is the editor of Polemia.com, and his latest book is La Tyrannie Médiatique (The Tyranny of the Media).